Kueh Dadar, is yet another popular ” nyonya kueh” snack which many of us grew up eating. Better known as “Kuih Ketayap” or simply “Kuih Tayap” this snack of Malay origin was part of the “3 for $1” assortment of kuehs available at pasar malam stalls especially at the raya bazaar during the Ramadan fasting month. While my mum would take the opportunity to shop and browse for new curtains, cushion covers etc, I would just “jalan jalan” along with her and my aunties munching on kueh dadar and other snacks. My cousins and I would deliberately choose different kuehs so that we would have a much larger range which we could share amongst ourselves than when we would be able to have it on our own. I remember fondly how we bellowed in exclamation, shouting at each other in our colloquial tongue “Eh, not fair lah! I also never eat so big piece from yours hor!” as we took turns to munch on each other’s kueh, screaming at each other for taking bites purportedly larger than what we had previously taken from the each other’s stash. All part of the fun of growing up! 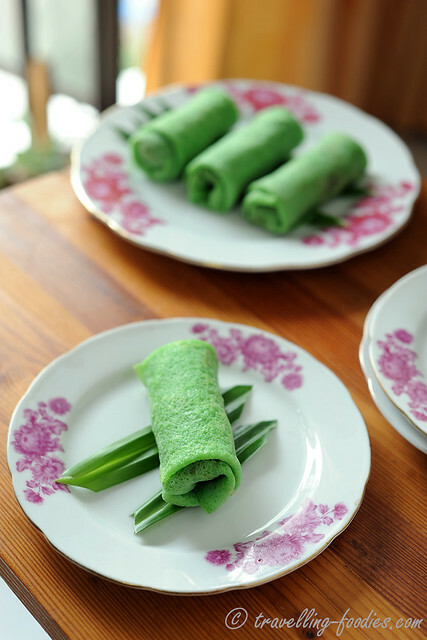 Essentially a rolled up crepe with grated coconut filling cooked in coconut sugar, they are no longer available at that kind of prices anymore of course. In fact what one has to pay for these delectable morsels of sweet and rich kuehs have escalated so much especially over the last couple of years make me wonder if I should even buy them outside anymore. Yummilicious yes but wallet damaging… hence began my experimentation on making these kuehs on my own, starting with my favorite ondeh ondeh and my mum’s favorite kueh lapis. Unlike traditional peranakan or malay cooking which may ask for a wide variety of components especially in the making of the rempah, i.e. spice paste, nyonya kuehs usually require only a small handful of ingredients making them much more approachable. Hence I’d made a few videos as part of a tutorial guide for this lovely snack which I enjoy very much, in hope that you too like me, would begin your journey of making nyonya kuehs on your own. There are two components in this kueh and we begin by making the inti, i.e. a filling made with freshly grated coconut (kepala parut) cooked in gula melaka syrup. Some recipes for making the inti calls for a combination of both gula melaka and white sugar but I would suggest using 100% gula melaka instead if you want a truly sensational palate experience. Gula melaka in comparison with white sugar is mellower in terms of sweetness but hugely makes up for it by imparting a wonderful earthy richness, tantamount to a mind-blowing experience as one takes the first bite. Cooking the inti is fairly straightforward. Just a matter of gula melaka with a splosh of water cooked and reduced to a thick syrup before adding the grated coconut. The final product must be fairly moist but not soggy wet. This can be easy checked by tilting the pot or saucepan, pushing the grated coconut to one side and see if any liquids leach from the it. Once nothing flows out, the filling is basically good to go. The versatility of this inti allows it to be used in many nyonya kuehs, most notably pulot inti, kueh koci and buah melaka, the last being a variation of ondeh ondeh which uses a grated coconut inti in place of pure gula melaka. Its use has also being extended by local confectioneries as a filling for sweet mini buns. Then comes the skin wrap for encasing the inti. The recipe is also fairly straightforward using the standard eggs and flour. There are some recipes which also incorporate sago flour to provide a slightly chewy texture. Coconut milk is used for the kueh dadar wrap in place of milk used in the standard french crepe. But the procedure it pretty much the same. After mixing all the ingredients, the batter is strained to ensure that there are no flour lumps and unbeaten egg whites in it. This helps to keep the batter really smooth and runny. 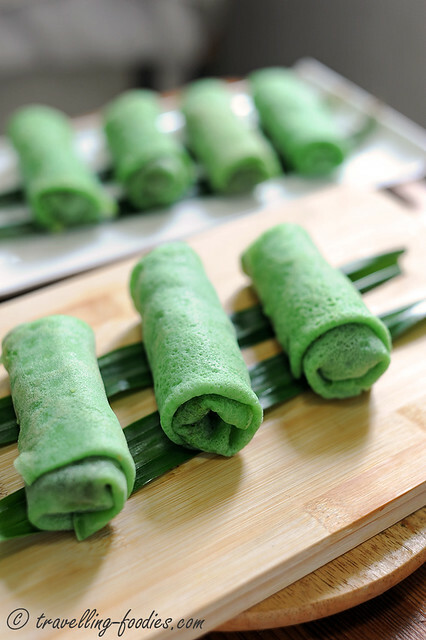 For the skin wrap, pandan extract/paste is used instead of freshly squeezed pandan juice. 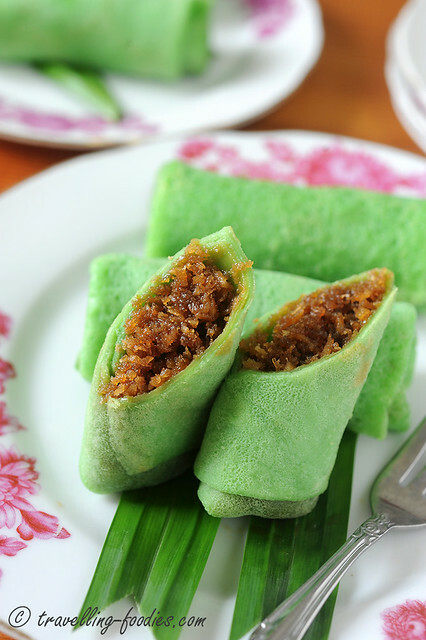 Unlike other kuehs where the “pandan-ness” takes centrestage, it is really the gula melaka kepala that is the star in this dish. So pandan juice isn’t really necessary here. My default extract is shown in the video and it works really well as a substitute for any bake or make that requires pandan as a component. How much paste to add, well it all depends on the intensity of the colour one wishes for. One way is to err on the safe side if it is the first time you are making this kueh and add a little of the extract. Test the batter by cooking a very small amount of it, no bigger than the size of a blini to see if its the right colour you like and then adjust with more extract accordingly. Better less than more as it is more forgiving to look pallid pale than gruesome gaudy. The cooking process uses a flat non-stick saucepan that is greased very very lightly. In addition to the fat content already in the coconut milk, the batter mixture included some oil so the act of greasing the non-stick pan is more precautionary than anything else. The flame has to be kept low at all times. In the video guide, you could hardly see the flame on my stove hob in fact. This prevents the bottom side of skin from browning too much while the other is not cooked. After the pan is heated, lift it up and tilt it slightly to the side facing the hand holding the ladle of batter. Do not add too much batter as it would cause the skin to become too thick and subsequently crack during the wrapping process. Also, one would end up eating too much skin which can be quite jarring. As the batter is being poured into the pan, gently swirl it around to coat the entirely base surface of the pan. It is this swirling action of the batter that gives rise to this kueh’s lesser known name, “Kuih Lenggang“. To check if the bottom surface is sufficiently cooked, slmply jiggle the skin gently. It is ready to be flipped if the skin is able to glide around the pan with ease. There are many ways to do the flip. One is to do it directly by tossing it into mid-air as seen in the video guide below but that requires some level of dexterity. Otherwise, lifting it gently with both hands on two wide ends, using a flat and large spatula, transferring it onto a plastic plate and subsequently doing a flip on it before transferring it back onto the pan all works, with varying levels of ease and comfort. And finally the assembly. This is also fairly easy for those who have done other snacks like spring rolls of any form i.e. 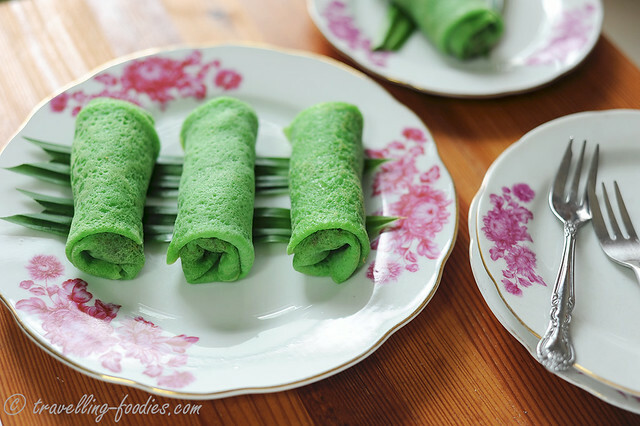 春卷 chun juan , 薄饼 popiah or Gỏi cuốn before. But one thing to note is the side of the skin to take the inti has to be the smooth side which was facing upwards during the cooking. The bottom which was cooked longer develops a lovely undulated and somewhat pockmarked texture becomes the exterior of the wrapped crepe giving rise to what a well-made kueh dadar characteristically looks like. More details on the wrapping process are discussed in the video. To cook the inti, first dissolve chopped gula melaka into water together with salt and pandan leaves in a small saucepan over a medium-low flame. 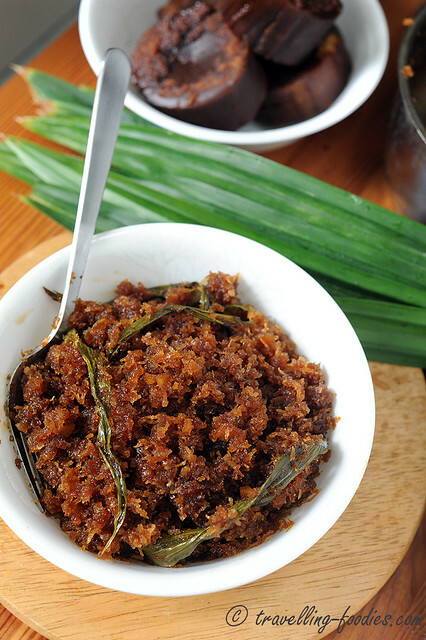 As the gula melaka syrup thickens, add salt and stir until until all the grated coconut is uniformly coated with the dark treacle like syrup. Continue to heat until the mixture there is no more excess moisture. Take off heat and set aside to cool down. In a mixing bowl, add flour and coconut milk and mix well. Add the rest of the ingredients and mix until a thin batter is obtained. Adjust the consistency of the batter with more flour or water/coconut milk. Strain the mixture over a fine sieve to remove any flour lumps or unbeaten egg white. For details on the required batter consistency, please watch the video here. To prepare the skin wrap, heat a medium sized non-stick pan (mine is 24 cm) over a medium-low flame. Lift the pan off the stove and tilt it to face the hand holding the ladle of batter. As the batter is poured into the centre of the pan, begin to swirl the batter around to coat the entire base surface with a thin layer. For details on the cooking and “lenggang” process, please watch the video here. Leave the batter to cook slowly until the bottom side is able to slide around the pan with ease. Flip the skin wrap and cook for another 10-15 seconds or so before removing and cooling off over a greased aluminium tin surface. Repeat to prepare more skin wraps with the remaining batter, remembering to stir the batter a little to homogenize it, preventing the flour from settling at the bottom. For details on the flipping and cooling process, please watch the video here. Once the skin cools down slightly and becomes manageable to be handled with bare hands, it is ready to be wrapped. Place a place of skin wrap on a flat surface with the smooth side facing upwards. Add approximately 2 tbsp of inti onto the skin wrap nearer to you. Fold the left and right sides of the skin bringing them towards the centre. Lift up the end nearer to you, rolling it over the filling and previously folded sides. Continue to roll away from you, maintaining a bit of pressure on the skin and filling to ensure that everything is well secured. Repeat the process until all the skin wrap and filling are used up. For details on the wrapping process, please watch the video here. This is really fun recipe to make, especially with children so do get them engaged, especially with the wrapping process! What’s more its so delicious to eat and all the better to snack and wrap along at the same time! Have fun! Once again, here are the videos which I have uploaded onto youtube. PS: This is my first video tutorial guide on this blog so although I might not sound like it, I was pretty nervous! So do let me know if the videos work well for you and how I may improve on the presentation to make my next video better! This entry was posted on August 14, 2013 by Alan (travellingfoodies). It was filed under Food, Simple Eats and was tagged with grated coconut, gula melaka, kueh, Kueh Dadar, kuih dadar, kuih ketayap, kuih lenggang, kuih muih, malay, Nonya, Nyonya, pandan, Peranakan, snack, straits chinese. Thank you so much for this! I was just dreaming of kueh dadar and I see this post in my inbox! I must be dreaming really hard… hahaha.. Will definitely try it this weekend! Wow! Thanks for sharing! In fact, I truly appreciated the fact that you and some bakers out there (Wendyinkk, Anncoo, Dequeen Kitchen, SSB etc., just to name a few) who took the time and effort to do write ups to share out recipes. It’s definitely great help to novice bakers like me! Will definitely try this out some day and I am gonna use this filling if I were to make your ondeh ondeh again! Thanks again! I was also running this thought in my mind as the video cam is like an white elephant at home. But the thought of editing deters me as I read that it is very time consuming. Well done and I am looking forward to more of your videos. nice presentation and perhaps delicious to taste. Your Kueh Dadar looks so yum especially the skin! Great post!